John Oxley and the Chain of Ponds | There once was a creek . . . The monument at North Quay commemorating Oxley’s landing. 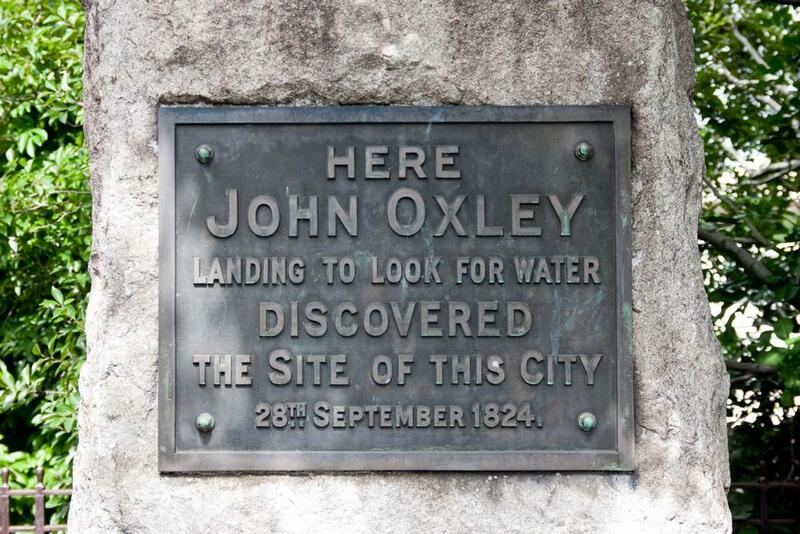 The text reads: Here John Oxley landing to look for water discovered the site of this city. 28th September 1824. The monument at Milton commemorating John Oxley’s landing. 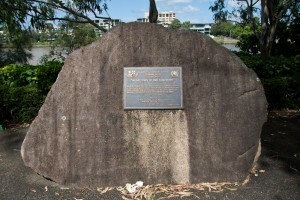 The text reads: On 28 September 1824, Lieutenant John Oxley, Surveyor-General of New South Wales, landed hereabouts to obtain fresh water from a nearby stream declaring it to be “by no means an ineligible station for a first settlement up the river”. History is nearly always subject to some level of interpretation. But can there be many cities in the world where you can find not one but two monuments, in quite separate locations, marking the spot where it all began? 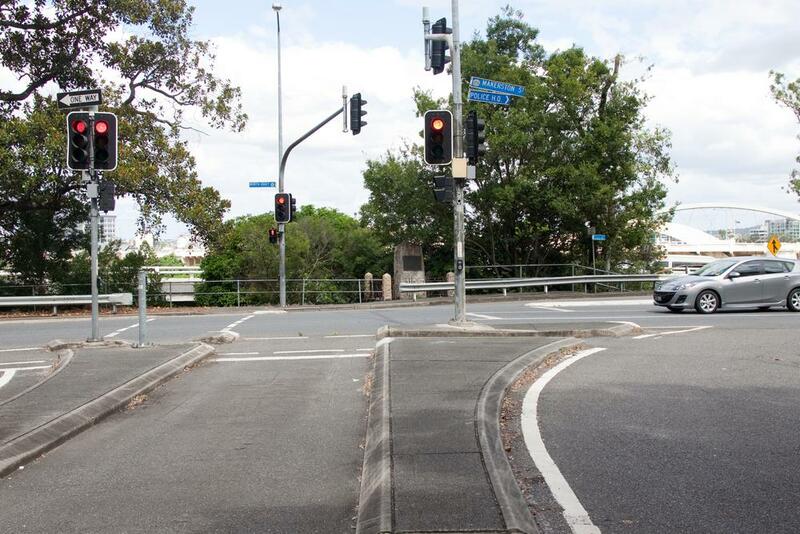 In Brisbane you can find just this — one in North Quay near Makerston Street, erected in 1928,1 and another erected sixty years later and one mile upstream where Coronation Drive overlooks the mouth of Western Creek (known today as Milton Drain). Until very recently I didn’t know that either of these monuments existed, despite having travelled past them countless times in my life. I came across the boulder at Milton not long after I started exploring and learning about Western Creek. But if not for the instructions provided in Matthew Condon’s book Brisbane,2 I doubt I ever would have found the obelisk at North Quay. Once you know where to look, you can’t miss it; but in all likelihood you have never had cause to walk past it. And despite its imposing size and grand setting, it has been all but swallowed up by the surrounding vegetation, roads and guardrails. Its big, bold capital letters shout “Hey, look at me, I’m important!”, but everything else suggests that it has been neglected and forgotten, as if the world around it has somehow moved on. The John Oxley memorial at North Quay, seen from the path behind it leading to the riveside bikepath. So what happened? Is this any way for a city to treat its history? For the full story behind this monument — or about as much of the full story as could be told so long after the fact — I can only recommend reading Matthew Condon’s Brisbane3 (or at least flicking through to the history bits like I did!). To put it briefly though, the North Quay obelisk was the brainchild and pet project of Dr Francis William Sutton Cumbrae-Stewart, who was a lawyer, lecturer, university administrator and founding president of the Queensland Royal Historical Society. After looking at John Oxley’s field book, Cumbrae-Stewart convinced himself — and apparently others — that Oxley ‘discovered’ the future site of the city upon landing and finding water at North Quay on 28 September 1824. Cumbrae-Stewart proposed a memorial to mark the centenary of this historic event, and through his persistence, along with a few connections in high places, he eventually saw his vision realised. The obelisk was unveiled sometime in 1928, though exactly when, and by whom, nobody seems to know. And so the obelisk stood, apparently unchallenged, until in 1950 a historian by the name of T.C. 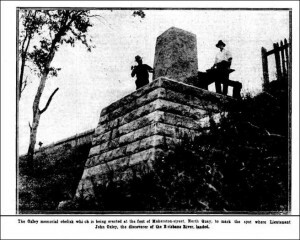 Truman published a series of four feature articles in The Courier Mail under the title “Rewriting the history of the birth of Brisbane”. In the third article,4 through a careful analysis of Oxley’s field book, Truman more or less demolished Cumbrae-Stewart’s theory about the landing North Quay. He showed instead that Oxley’s landing and his discovery of fresh water most likely happened somewhere in the vicinity of Western Creek. But strangely enough, it seems that no-one had the heart to remove or rebadge the memorial at North Quay. Perhaps even back then not enough people knew or cared about the memorial for its inaccuracy to matter. Finally in 1988, amidst Australia’s Bicentenary celebrations, a new monument commemorating Oxley’s landing was established along Coronation Drive, this time carrying the authoritative blessing of the Australian Institution of Surveyors. This stone is even bigger than the one at North Quay. Below it are the remains of a restaurant that used to be called ‘Oxley’s on the River’. 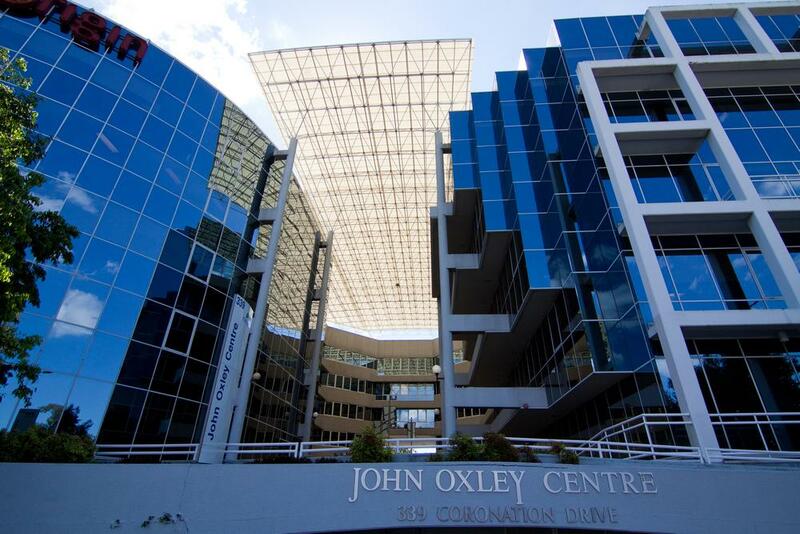 And across the road there is a whole office block named the John Oxley Centre, where at entrance you can see a strange flag-like installation embossed with snippets from Oxley’s diary.5 Resistance is futile: THIS is where Oxley really landed. Don’t listen to the obelisk down the road: it doesn’t know where it’s at. It doesn’t even know about commas! What are we to make of the misplaced monument that time and punctuation forgot? Why did it stand uncorrected for so long, and why is it still there today, now that a new memorial has been established? I will leave these questions for the reader to ponder, for answering them is not the purpose of this essay. Instead, I want to go back to September 1824 and examine the events in Oxley’s diary in light of all that we know about Western Creek. 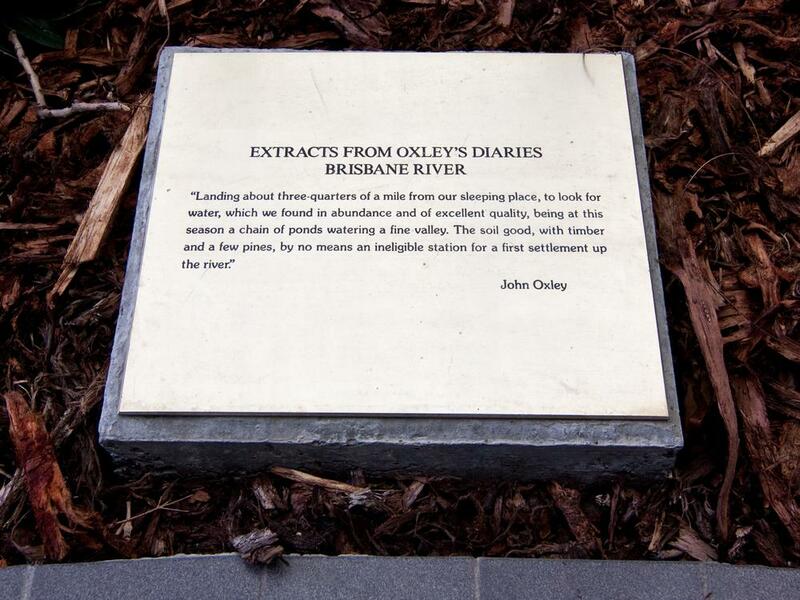 Whether or not we take Oxley’s landing on 28 September 1824 to be the ‘discovery’ of Brisbane, I find it quite thrilling to imagine John Oxley (along with Allan Cunningham) roaming around what would one day become Milton and Rosalie, surveying the landscape in search of fresh water. Our own exploration of Western Creek would be incomplete without us doing all we can to retrace his steps and imagine what he might have seen. In September 1824, John Oxley, then the surveyor-general of New South Wales, embarked on his second expedition up the Brisbane river, having first explored it in December 1823.6 He had returned to Moreton Bay to assist Lieutenant Henry Miller in establishing a new convict settlement, and to further explore the river in the company of the Colonial botanist Allan Cunningham and Lieutenant Butler of the 40th Regiment. 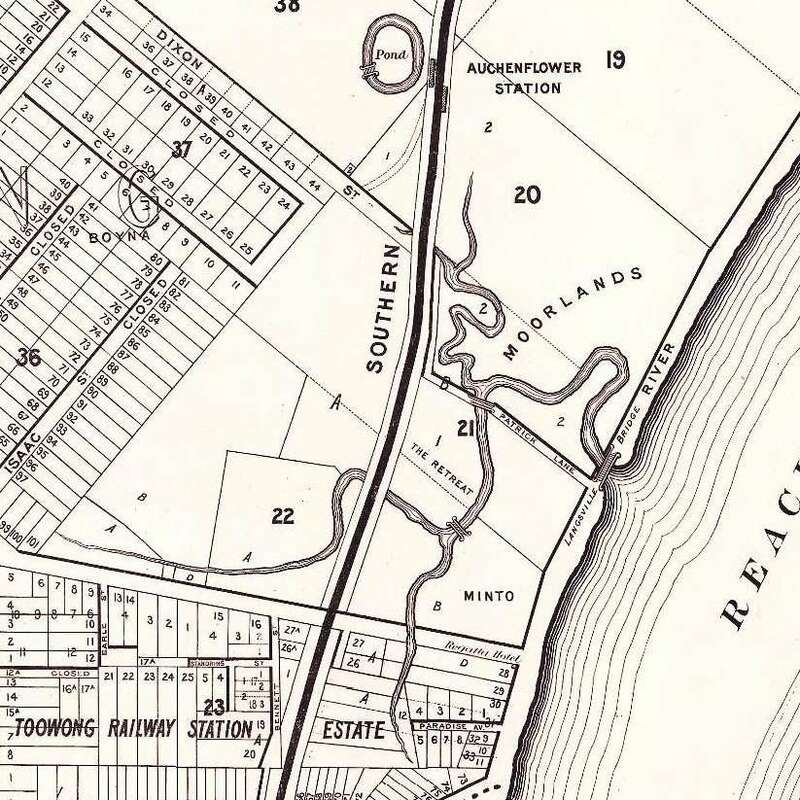 At Oxley’s recommendation, a site at Redcliffe Point was chosen for a first settlement. But there was also interest in establishing a settlement along the river, and one of the goals of Oxley’s expedition was to scope out a suitable site. 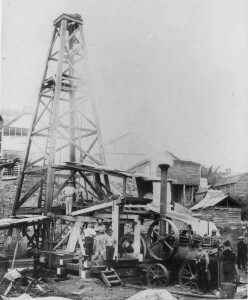 Oxley set off on Thursday, September 16th and by Tuesday the 21st had taken the boats as far upstream as the Mount Crosby area, at which point the boats could go no further due to the “very low and depressed state of the stream” (this and other comments in Oxley’s diary indicate that the area was in the grip of drought). He and Cunningham continued on foot up Mount Crosby and Pine Mountain to see the view to the west, before commencing the return journey back down the river on Saturday the 25th. The bridge over Langsville Creek, Auchenflower, ca. 1914. John Oxley Library, State Library of Queensland, Neg: 10579. The small creek by which they camped was the inlet that later became known as Langsville Creek or Patrick’s Creek. 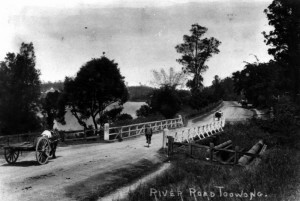 This watercourse flowed through what is now Moorlands Park and under the ironically named Land Street, and met the river near where Patrick Lane meets Coronation Drive. 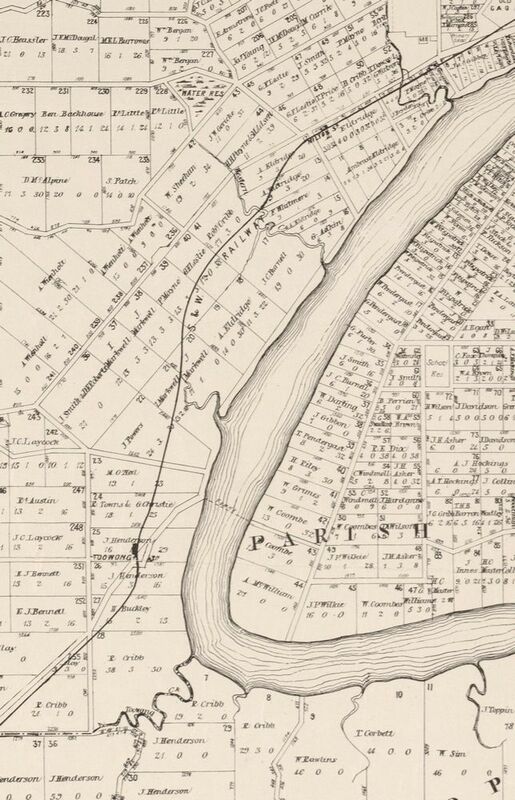 Its meandering branches are depicted clearly on McKellar’s 1895 map of Brisbane, as shown below. The second map below dates from 1884 and shows the entire Crescent Reach and its four creeks, starting with Toowong Creek at the bottom, followed by Langsville Creek, Western Creek, and finally Boundary Creek, which for a time marked the western limit of Brisbane Town. What’s left of Langsville Creek – the drain at Moorlands Park, Auchenflower. We had intended to visit their camp, but considering that we might disturb them, and certainly fright away their women and children, the intention was given up, and we proceeded down the river, landing about three quarters of a mile from our sleeping place to look for water which we found in abundance and of excellent quality, being at this season a chain of ponds watering a fine valley. The soil good, with timber and a few pines, by no means an ineligible station for a first settlement up the river. The pages containing this passage in Oxley’s field book (which is held today in the State Library of New South Wales and can be viewed online), are shown below. By four o’clock the same afternoon, following a long row against the tide, Oxley’s party had reached the bay, and at around 10 o’clock that night they arrived at Redcliffe, where Oxley’s brig the Amity was moored. Oxley said nothing more in his diary about the fine valley or the chain of ponds that he saw as worthy of supporting a new settlement. These few lines form the entire basis for both of Brisbane’s foundation stones. Given how few details there are to work with, we should hardly be surprised that people have reached different conclusions about where Oxley landed and found water on 28 September 1824. But while can never be absolutely sure about where he landed, we do have enough clues to make a solid educated guess. Assuming that Oxley’s judgements of distance were accurate (and they should have been, given his experience as a seaman and surveyor), we need nothing more than a map and a ruler — or better still, Google Earth — to figure out where he landed. 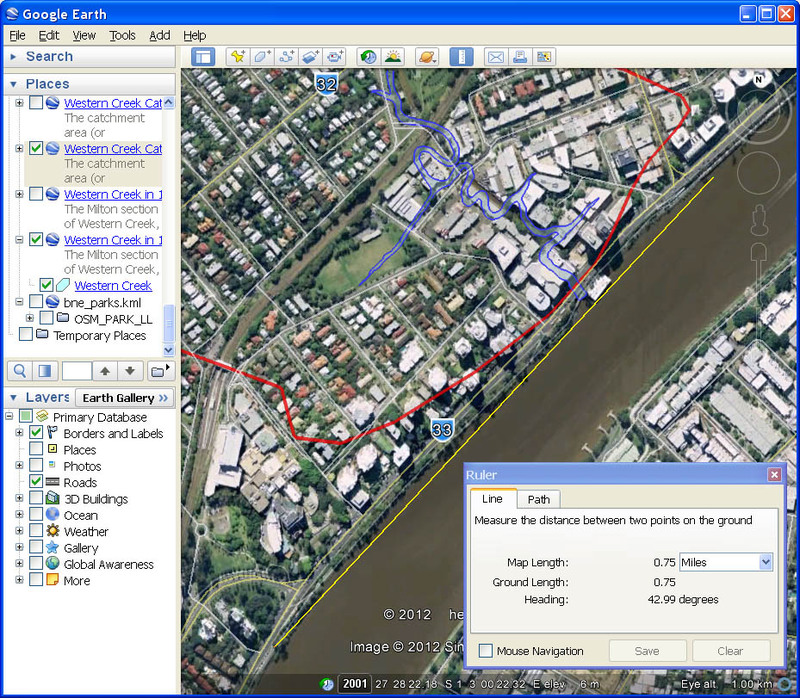 Using the ruler tool in Google Earth, you can check for yourself that the distance between the start of the Toowong reach and Patrick Lane, where Oxley camped, is indeed about half a mile (~800 metres). Following the river for another three quarters of a mile puts Oxley’s landing place somewhere in the vicinity of Park Road. Park Road?! But neither of the two monuments is there! This is true, but the one at Milton is not far away (about 300 metres upstream), and its inscription permits some wiggle room thanks to the word ‘hereabouts’. I think the simplest supposition we can make is that Oxley saw Western Creek, and with the tide low,8 looked for the nearest convenient place to come ashore. From here there are not many dots to join before concluding that the chain of ponds Oxley found was probably somewhere along Western Creek. We’ll join those dots in a minute, but first it’s worth exploring some other possibilities, if only to see if we can discount them. If Oxley had walked down the river instead of heading back upstream to Western Creek, he would have first passed through what is now the Kings Row Office Park, which is bounded by Coronation Drive, McDougall Street and Cribb Street. There was once a lagoon that joined the river here and stretched all the way to the corner of Park Road and Milton Road. This lagoon is shown on James Warner’s map from 1850, annotated as “Good Fresh Water Lagoon”. However, this lagoon was probably dry when Oxley visited, or at best it would have contained the same water as that in the river, which evidently did not meet Oxley’s standards. During the summer of 1886, this lagoon dried up to such an extent that the land was subdivided, sold and built on without anyone apparently realising that it was ordinarily a water body.9 The drought that prevailed during Olxey’s 1824 visit had probably left the lagoon in a similar condition. And besides, a lagoon situated amidst such flat terrain could hardly match Oxley’s description of the ponds “watering a fine valley”. 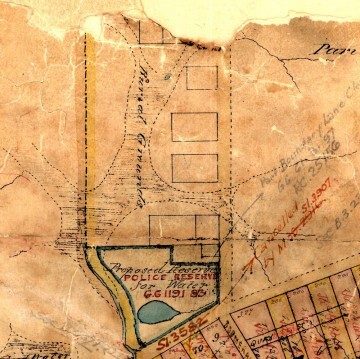 The lagoon that once stretched between Cribb Street and Park road (foreground), and Boundary Creek, as depicted on a map from 1850. 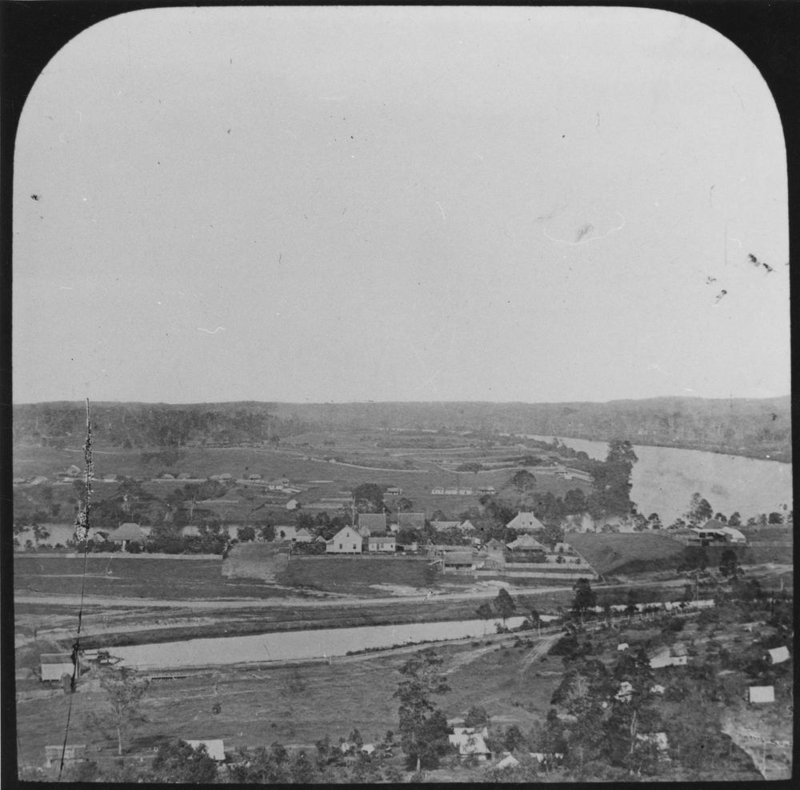 A little further downstream was Boundary Creek, which meandered through the Coronation Drive Office Park and opened into a swamp where Suncorp Stadium is today. 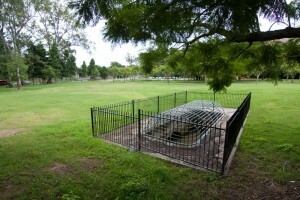 This is where Brisbane’s second cemetery was established. James Warner’s map from 1850 shows the swamp clearly, and also indicates an area near Officeworks as a source of “Good Water”. Near the stadium a small dam had also been built along a tributary of Boundary Creek: this was known as the Milton Water Reserve. The swampy area of Boundary Creek, Milton, as depicted in 1850. 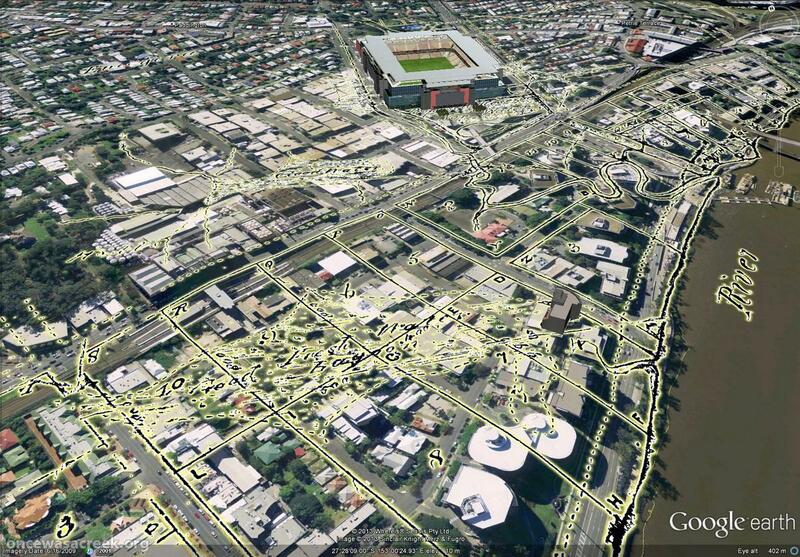 The area was first used as a cemetery, and is now Suncorp Stadium. Despite Boundary Creek having a relatively small catchment (the boundary of which can be defined approximately by Petrie Terrace, Musgrave Road, Enoggera Terrace, Latrobe Terrace and Given Terrace), there was evidently a good amount of fresh water in this area, at least when James Warner did his survey. Could there have been a chain of ponds here during the drought when Oxley visited? Maybe — but only if the ponds were springs fed by the underground water table, or if there was a spring somewhere upstream. Without an underground water source, the streams and ponds in such a small catchment would have dried up quickly without good rainfall. 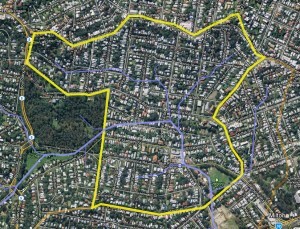 But then again, the same could be said of Western Creek, the catchment of which is only two or three times bigger. So perhaps there might have been a chain of ponds along Boundary Creek in 1824, nestled within the surrounding hills. I admit that I don’t have a strong argument to rule this out as the location of Oxley’s ponds, except to note that it is further than Western Creek from where Oxley apparently came ashore. 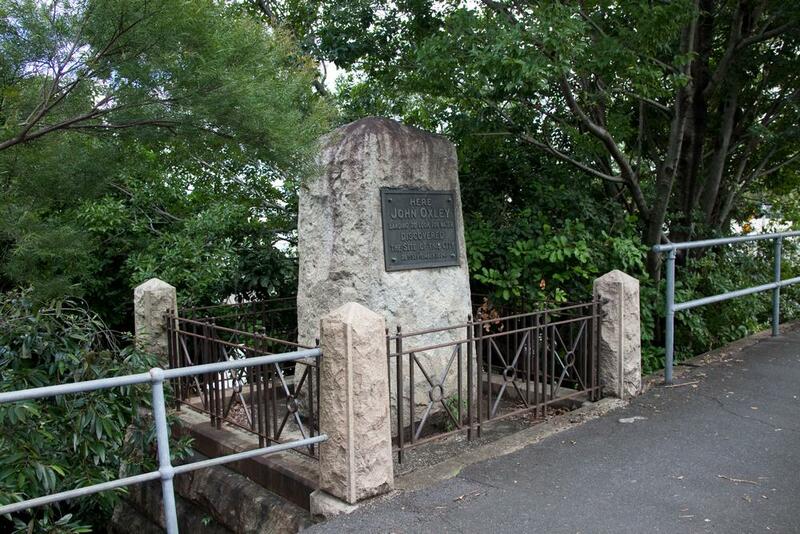 Stretching Oxley’s legs (as well as our credulity) a little further, we could suppose that Oxley walked all the way to Roma Street, where he would have found a creek10 that was fed by a spring (the namesake of Spring Hill), and which ultimately became Brisbane’s first water supply. Fresh water in abundance, and in the very place where the town was ultimately established — these pieces of the puzzle fit. But from here it is nearly a whole mile back to Park Road where Oxley apparently landed. Surely a walk this far downstream, especially one that included a creek crossing, would have rated a mention when Oxley recorded the location of fresh water. Yet in his diary there is not even so much as a comma separating the landing and his discovery of the chain of ponds. Recall that Oxley described his landing place as being about three quarters of a mile from his sleeping place at Langsville Creek. The distance from his sleeping place to Boundary Creek is more than a mile. For this to be his landing place, he would have had to misjudge the distance by about 0.4 miles, or around 650 metres. Put another way, this equates to about a 50% error on his estimated distance. It’s hard to believe that someone as experienced as Oxley could have got it this wrong. 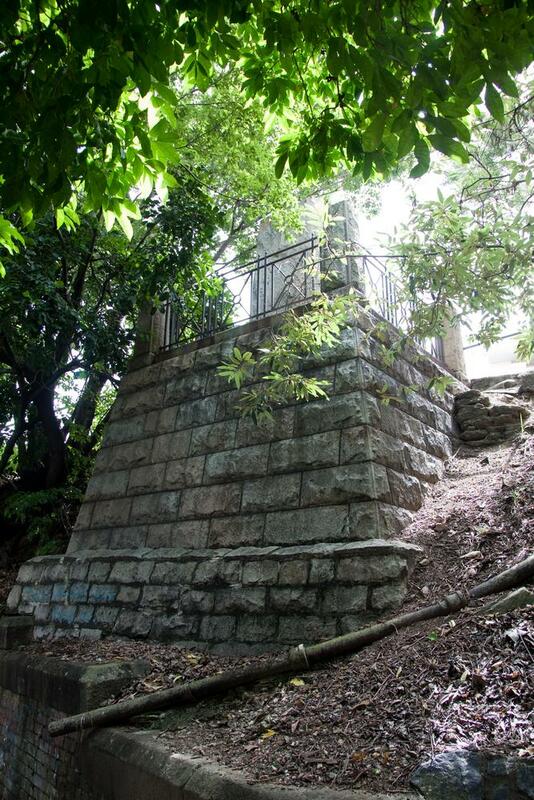 The monument at North Quay is further away still, and as Matthew Condon notes, it stands at the top of a steep and rocky cliff — one of the highest points along that part of the river bank, and surely one of the last places where someone in a rowboat would choose to scramble ashore. Then again, perhaps Cumbrae-Stewart didn’t really believe that Oxley landed here. Perhaps, as the quote above suggests, he believed this to be the vantage point from which Oxley saw the chain of ponds and the site of the city, having landed at some other place close by. In fact, the strange unpunctuated sentence on the obelisk could be read to mean just this. Maybe it was meant to be ambiguous all along to cover for Cumbrae-Stewart’s own uncertainty about where the obelisk should go. Either way, the obelisk is in the wrong place. And yet there it stands, without so much as a supplementary footnote advising the unsuspecting reader that the correct site is a mile further up the river. 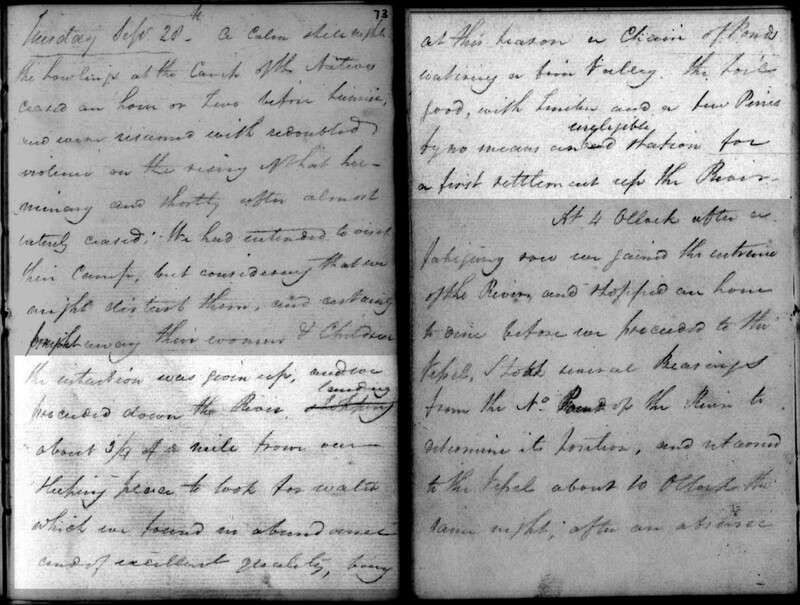 Let’s return to the simplest interpretation of the events recorded in Oxley’s diary for the morning of 28 September 1824. Convinced that there must be fresh water somewhere along the Crescent Reach, Oxley landed just downstream of Western Creek, which he then followed inland to find the chain of ponds watering a fine valley. The question that follows is where were the ponds? We might call this the ‘chain of parks’ theory, and it has obvious appeal. 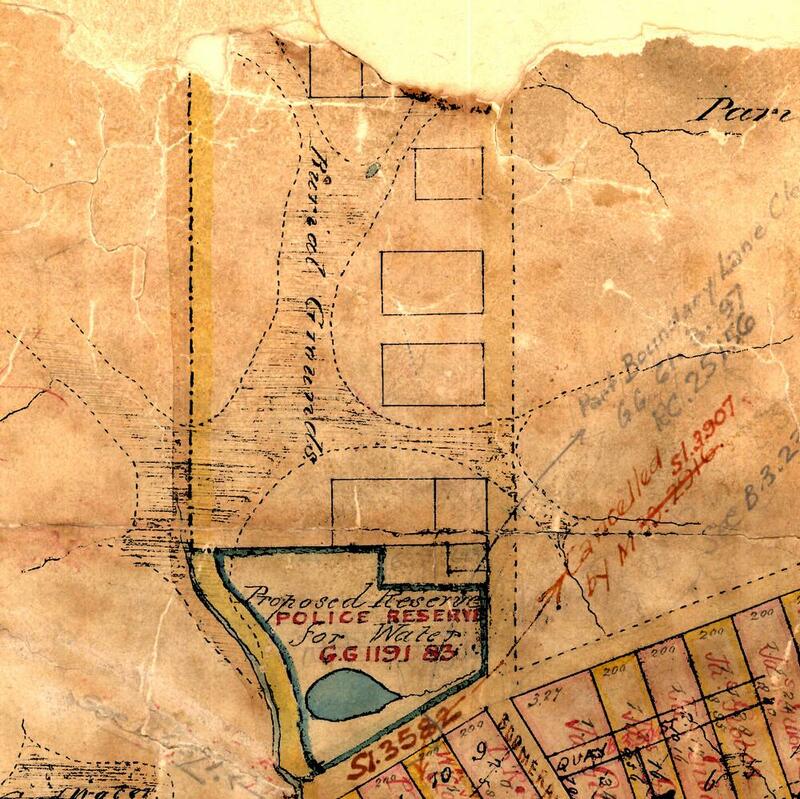 It is easy to imagine a chain of waterholes extending from Gregory Park (which we know was once Red Jacket Swamp) through Frew Park, Milton Park, and even Dunmore Park (which also was once a swamp). If you were here during the floods of 1974, 2011 or even 2013, you might not need to imagine it at all. As for the ‘fine valley’, if we’re honest we have to acknowledge that the land is pretty flat in all directions until you come as far upstream as Frew Park, and it doesn’t really became ‘valley-like’ until you reach Gregory Park, where you can see the slopes of Heussler Terrace in one direction and Howard and Thomas Streets in the other. Still, there is enough overlap here with the chain of parks to keep this theory alive. But before we leap to conclusions, there are other things we need to consider. Remember that Olxey was not interested in just any old water: he was after fresh water, which he apparently found “in abundance and of excellent quality”. In trying to identify the location of the chain of ponds, we need to think about what sort of water might have been present in different parts of the landscape, and where it might have come from. 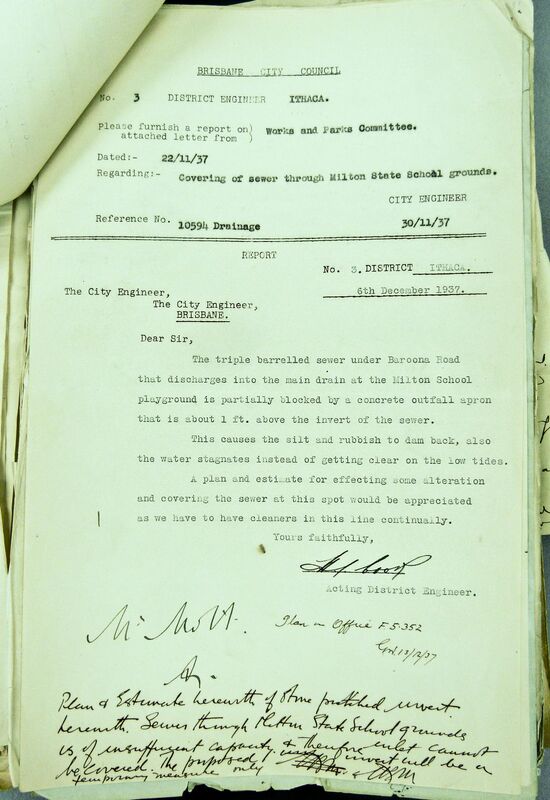 Correspondence between Council engineers in the 1930s suggests that the tides even reach under Baroona Road.16 Under this tidal regime, there could not have been ponds full of pure, fresh water anywhere between the river and Gregory Park, because they would been inundated daily with brackish water from the river. 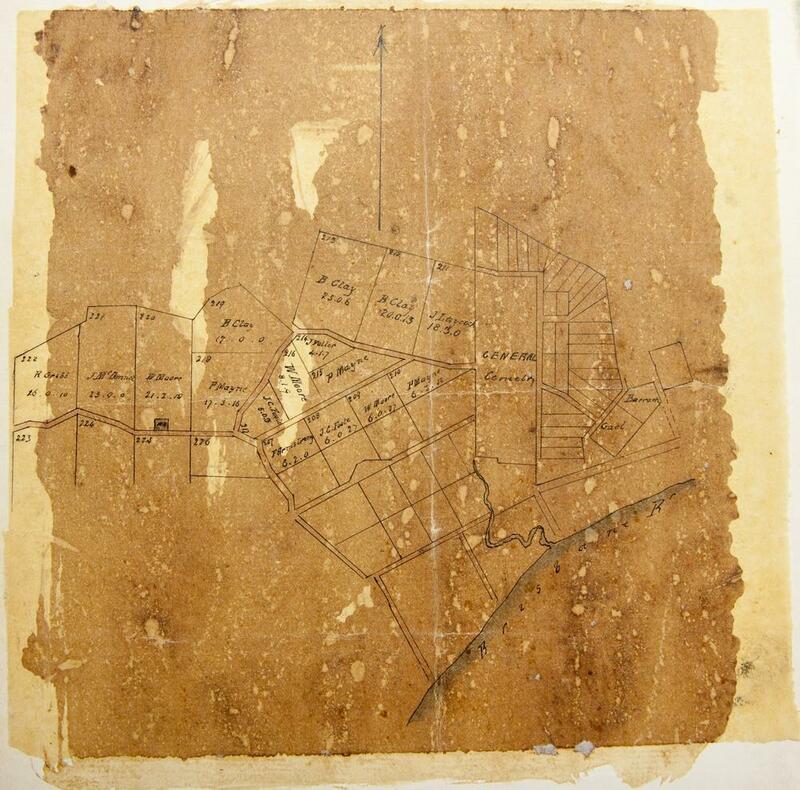 in fact, something on James Warner’s map from 1850 suggests that the creek was fresh even further downstream. At a swampy region just near where Kilroe Street is today, there is a small pond marked “Good Water”. Perhaps during wet periods the river itself was fresh here too, whereas during drought the tides would reach further, bringing salty water with them. Western Creek as depicted on a map from 1850. In the foreground is a pond marked ‘good water’, and in the distance is Red Jacket Swamp. The rest of the map is discussed on this page. The bottom line is, I don’t know whether the chain of ponds could have been as close to the river as the chain of parks is today. It seems plausible, but someone who knows more about the river’s history than me will have to chip in if we are to have a definitive answer. In the meantime though, we would do well to consider other possibilities. Let’s suppose that the chain of ponds was a little further upstream. Following the course of the creek from Gregory Park through the Rosalie Swamp,20 we might imagine a series of ponds in the low-lying backyards along Elizabeth and Beck streets, continuing to the bottom of the Government House grounds and Norman Buchan Park, where, lo and behold, there is a pond even today. What’s more, the surrounding hills here are higher and steeper than those around Frew Park and Gregory Park, and they can be seen extending all the way up into Rainworth and Bardon — a fine valley indeed! David goes even further. Now he’s concentrating on the ‘fine valley’ that Oxley observed. … A couple of weeks later he emails me a map. He believes he has ascertained the valley. He has tracked what he believes are the headwaters of the stream and its chain of ponds. He has discovered untouched and overgrown gullies deep in the heart of this patch of inner-city suburbia. 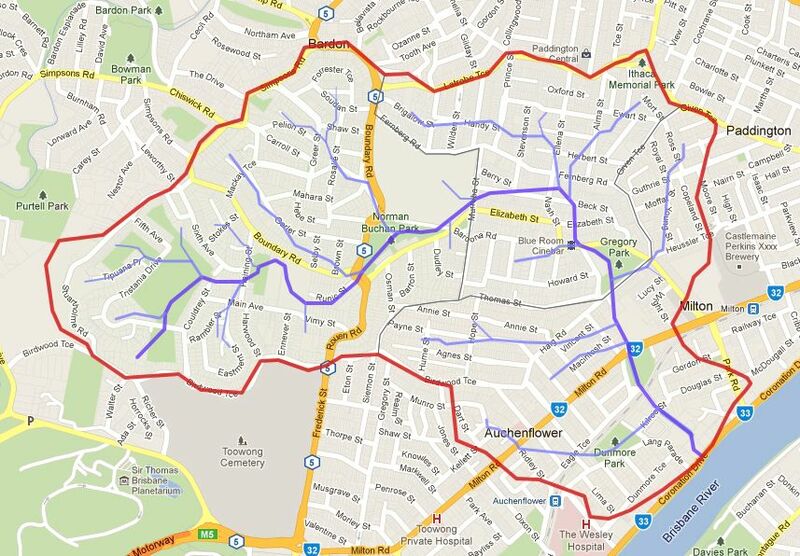 The ridges that Condon describes in David’s map are precisely those on my own map of the Western Creek catchment. The overgrown gullies that David discovered are the channels running through in what I call the Weedy Wonderland, and they indeed form the headwaters of Western Creek. 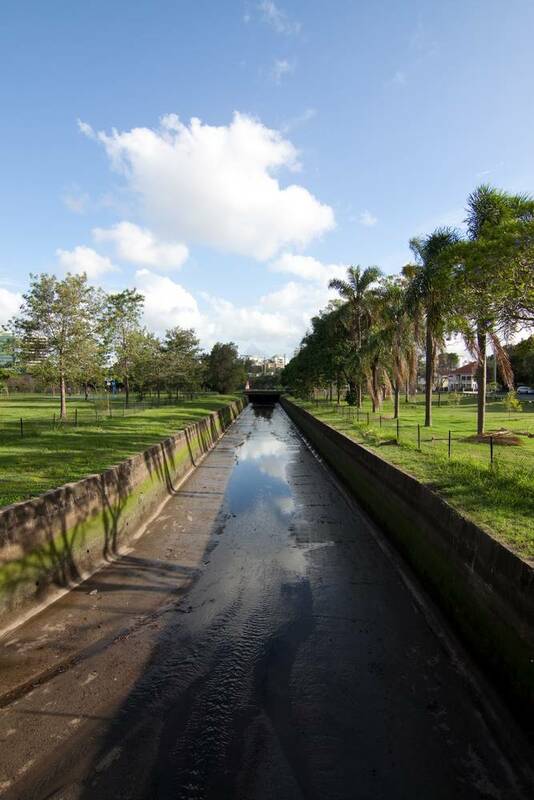 A network of drains now conveys water from these channels and other upper parts of the catchment to the governor’s property, and from there through to Gregory Park, Frew Park and Milton Drain. In Oxley’s time there would have been a creek running all the way through. Is this then the source of the chain of ponds? 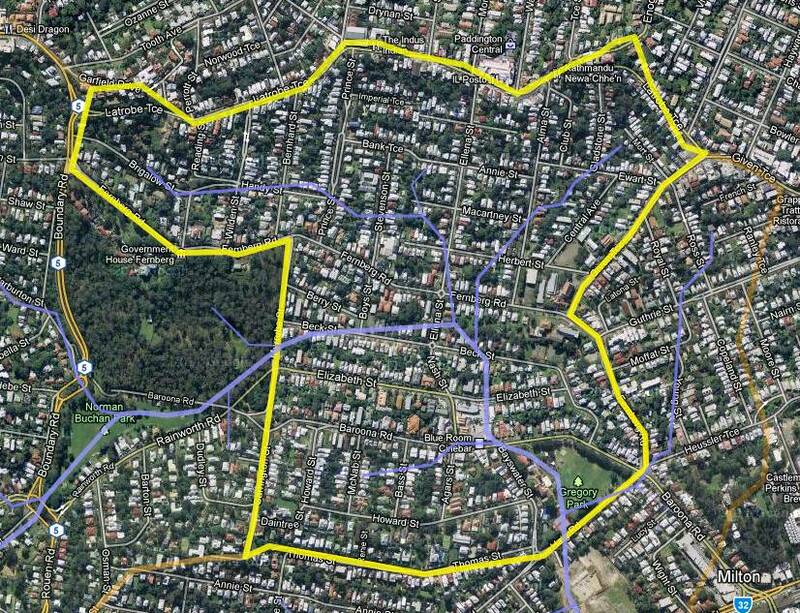 Western Creek drains a sizable catchment area, but unless decent rain has fallen, you will rarely find more than a trickle left in Milton Drain once the tide drops. If there were no concrete drains to carry the water away, it would have a chance to form ponds; but in dry periods even these ponds would not last very long if fed by runoff alone. To draw any conclusions about the source of Oxley’s chain of ponds, we need to consider something that has been missing from this analysis so far — the weather. The whole country bears the marks of extreme drought, and I should think it must have been many months since rains have fallen, at least of any consequence. Did the storm that passed south over Goodna hit the Crescent Reach as well? Could it have dumped enough rain to leave substantial ponds in Western Creek two days later? Given how dry the catchment must have been, I suspect that any rain that did fall would have been quickly soaked up by the thirsty ground. Remember that Oxley searched for water at Langsville creek on the evening of the 27th (the day after the storm) but failed to find any, suggesting either that the rain had already drained away or that there was little of it in the first place. And even if the storm had replenished the waterholes of Western Creek, surely Oxley would have recognised this as an isolated event when reporting a reliable source of fresh water. Indeed, what else could he have have been thinking when he wrote about the water “being at this season a chain of ponds”? 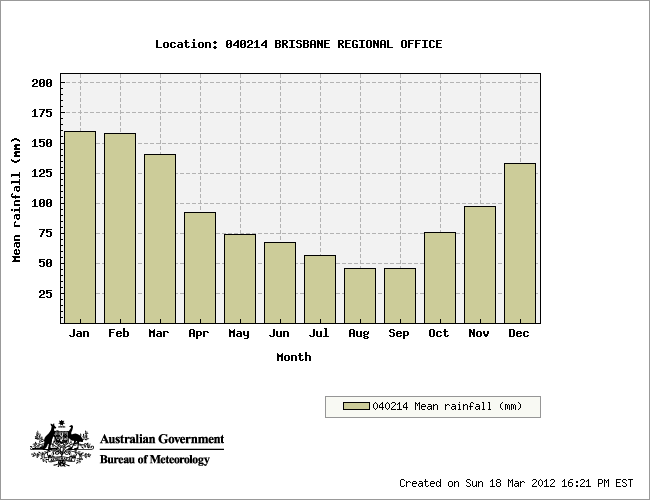 When I first read about Oxley’s chain of ponds in Matthew Condon’s Brisbane, I assumed that the words “at this season” referred to a wet period that had left the catchment saturated and flush with life. But the above analysis of Oxley’s field book reveals the exact opposite: Oxley was referring to a dry season, and not only that, a severe drought. What, then, was the source of the abundant fresh water that he found in the chain of ponds? The only answer that I can offer is that the water came from underground. Just like the creek at Roma Street that was dammed to supply the fledgling settlement, the ponds of Western Creek may have had their source in a spring — a surface expression of an underground body of water. Underground water, or groundwater, ultimately comes from the same place as surface water — that is, rain. But groundwater moves more slowly and collects in much greater volumes than water at the surface, making it an invaluable supply in times of drought or in places where surface water is hard to find. I have found one tantalising clue that there was indeed a spring in this part of Western Creek. In 1864, a petition was sent to the Secretary for Land and Works by J. C. Heussler, who was one of the early residents in the area and the first owner of Fernberg, which later became Government House. The petition was signed by local land owners, residents and farmers, and humbly begged “that a Water Reserve may be formed at the Red Jacket Swamp26 . 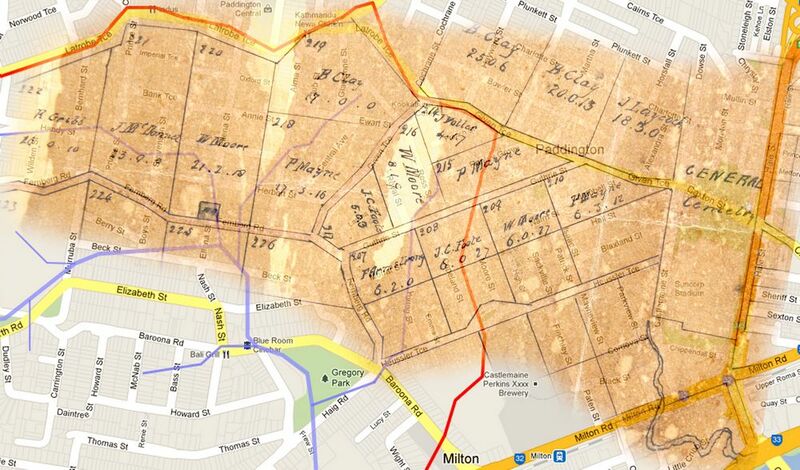 . . where there is a spring of the purest water upon which the inhabitants (some hundreds, and daily increasing) have been entirely dependent during the late drought”.27 A map included with the petition shows the location of the spring to be at the intersection of Fernberg Road and Ellena Street. The figure below shows part of this map superimposed on a modern-day street map. 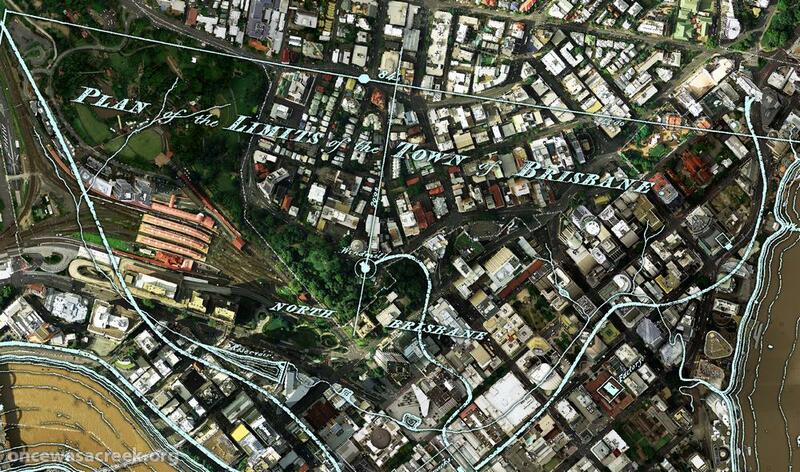 Also shown is the approximate path of Western Creek and its tributaries, derived from digital elevation data. This “constant spring . . . available at all seasons”28 could have fed a chain of ponds stretching all the way from Fernberg Road to Gregory Park. And who is to say that there weren’t other springs in the area? 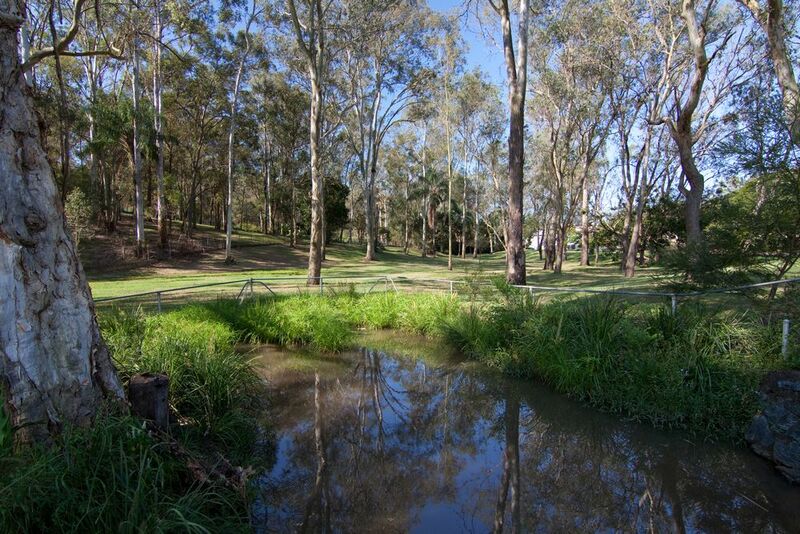 In fact it seems quite probable that a spring feeds the pond at the bottom of Norman Buchan Park and Government House. This pond, which apparently did not dry up even in the Millennium Drought29 does not appear to be fed by the drain, which seems to pass around or underneath the pond. This all suggests that the pond is fed by groundwater. Altitude 617 ft. Depth 600 ft. Yield per 24 hours 3,000,000 gallons. Pressure per square inch 185 lb. Temperature 115 degrees Fah. Boring machinery bore abandoned. The last two words suggest that the enterprise wasn’t very successful, despite the huge volume of water that was apparently tapped. Perhaps the quality of the water was poor on account of it being so close to the river. Whatever the case, it is a reminder that there is more water in the landscape than just what we can see. The source of the water aside, the presence of the pond at Government House still presents something of a mystery. Why was it not filled in like the rest of the creek? Perhaps it was filled in, but remained so boggy that it was returned to being a pond. At some point I hope to do some research and find out. Whatever the case, if this roadside waterhole really is one of the links in Oxley’s chain of ponds, then it should be treasured as a small miracle. We Australians are not known for taking a strong interest in our own history. Whether this is because we are embarrassed, ashamed or just plain bored by it, I don’t know. Clearly though, this national trait also holds true for the city of Brisbane. How else could we have tolerated a misplaced foundation stone that not only stood uncorrected for sixty years, but that has continued to stand despite being corrected for over twenty years more? We could do well to show a little more interest in our own origins, and to pay a little more attention to detail in doing so. At the same time though, a preoccupation with historical detail can be taken too far. We should never get too hung up on identifying exactly where Oxley landed, or which valley and which chain of ponds he encountered. For one thing, we simply don’t have enough information to do find out. Despite the dot-joining exercise above, and the similar efforts by T.C. Truman, David Barr and others, I don’t think anyone can say with absolute confidence where Oxley really came ashore and discovered water on the 28th of September 1824. And nor do we need to, for ultimately these sorts of details are not what matter. Yes, we can get a kick from knowing that we are standing in the very place where so-and-so discovered such-and-such; but as ever, we should be careful not to miss the forest of the trees — or in our case, the creek for the ponds. By considering what John Oxley’s observations mean for Western Creek, rather than just what the ponds and the valley meant for John Oxley, I hope to have drawn attention to some features of this suburban landscape that might otherwise go unnoticed or be forgotten. The creeks of the Crescent Reach, for example, though now largely covered or buried are in a sense still with us, having left their mark in the fine valleys that give shape to our parks and streets. There are creeks underground too, moving slowly, silently and invisibly except where they have found expression as streams, swamps, and ponds. These features have also been largely swallowed up, but here and there you might find one that has seeped through the cracks of the urban cover — like the little pond at the back fence of Government House. For all the fuss made (or not made) about the stones at North Quay and Milton, perhaps this pond is really the monument we should care about. As grand as they are, the stones are mere artifacts bearing no real connection to the event they commemorate. 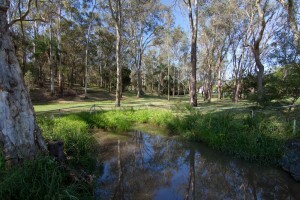 The pond, on the other hand, might just be a relic from the event itself — a direct link Brisbane’s foundation, and to the Western Creek of old. Or maybe not. Who knows? Either way, it’s worth giving some thought next time you get the chance to gaze over the Governor’s back fence. Great essay Angus – really well written – I want to rush out now and see all these sites from a different perspective! toowong area would not be there if there was no fresh water , they were called the Duke of York clan back then and also i have read of another camp of the Turrbul people being up where the present Woolworths is , they were never far from fresh water and lagoons for obvious reasons, another thing to think about at that time is the forests were a lot thicker as Government house area remains today so less evaporation from the sun, the ponds may have remained full.. the original tribes of people always travelled along pathways that followed watercourses and creeks and also their bora rings are always to be found close to fresh water, i am not sure but i have heard a rumour that there was a ring pretty much where the Regatta hotel is ..
A fascinating read from one who loves our Toowong Creek and often fantasises that we could get rid of the pipes and restore the whole creek! 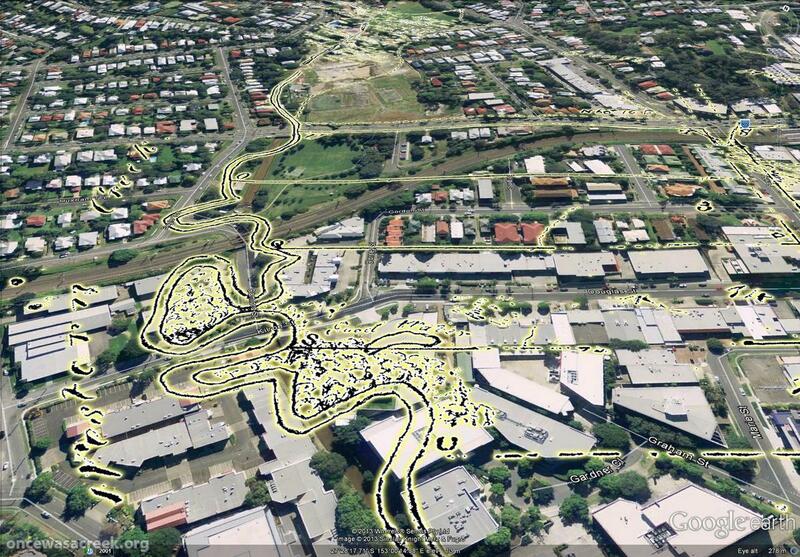 And wouldn’t Western Creek look better if it was not a drain! There is a well kept old historic colonial house in McDougall Milton St that was open as some sort of museum about ten years ago. (Next to the tennis courts) Built from memory about 1840. I has old photos and memorabilia on the wall dating from those early years.